Our offices are located on the second floor of 1700 Martin Luther King Jr. Boulevard in Chapel Hill. However, please note that some GPS navigation will not provide accurate directions. We recommend following the instructions below. Turn left at the 3rd stoplight, just past the Chapel Hill North Shopping Center, onto Perkins Drive. 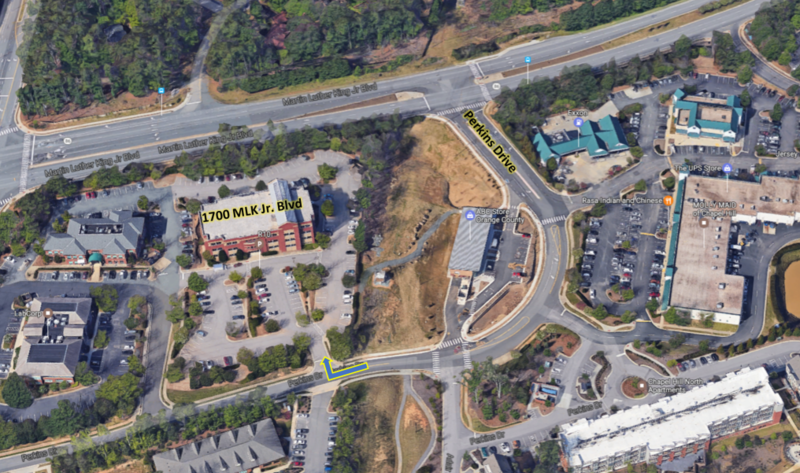 Our office building is easily reached by Chapel Hill Transit Buses on the NS and T Routes. Find a full schedule and maps of bus routes here. Any valid UNC parking permit can be used in the PiAP parking lot. If you need a visitor permit, please let us know in advance.